All images appear courtesy of ClarkeHopkinsClarke. 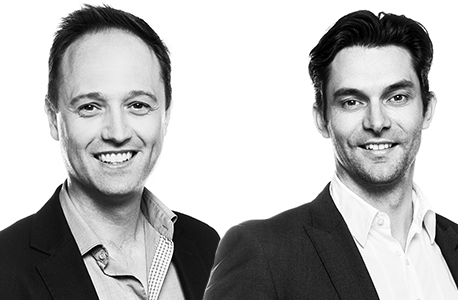 Above image (L-R): Toby Lauchlan and Dean Landy. ClarkeHopkinsClarke (CHC) is committed to delivering healthy, sustainable and thriving solutions for communities in new growth areas. With work spanning areas including education, multi-residential, health care and retail, ClarkeHopkinsClarke has proven itself versatile over its 60 years of practise. Shortlisted in the 2015 Interior Design Excellence Awards (IDEA) in three categories and with a book to be released by the end of the year, this practice is definitely one to watch. Emily Taliangis speaks with partners Dean Landy and Toby Lauchlan about some of their recent projects. Polaris 3083 is a major project. What challenges have you faced and how did you overcome them? Dean Landy (DL): Polaris is situated on the site of the former Larundel psychiatric hospital, a facility that was previously abandoned for close to 15 years. As the site was neglected for such a long period of time, the buildings have been severely damaged and vandalised, requiring significant work in order to maintain their heritage façade. The buildings have had to be pulled back to their base during construction and we’ve had to rebuild the majority of the roofs, floors and redo all the windows. We’ve really had to take the buildings right back to their shell and start from scratch. 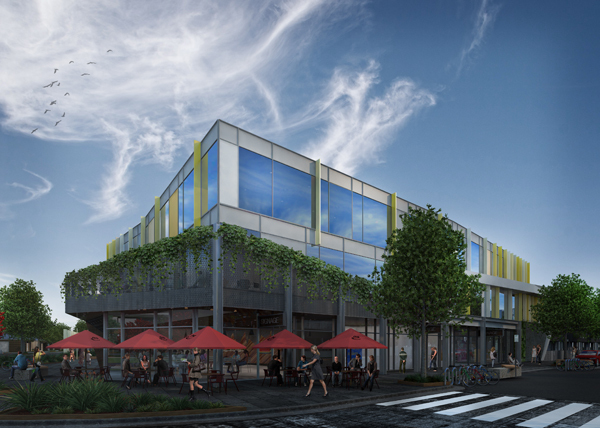 Working towards the long-term vision of developer DealCorp, the refurbished heritage buildings will be woven into the contemporary urban fabric to provide a unique sense of character. Four of the heritage buildings will be repurposed as apartments, with the remaining building readapted as a community centre. What were the key points of inspiration behind the project’s design? DL: DealCorp’s Andrew Wyman always saw the potential to develop Polaris as the ‘Carlton of the north’. The Polaris development draws influence from the intimate scale and medium density housing built around a central retail area, as established in inner Melbourne suburbs such as Carlton. Taking advantage of its location adjacent La Trobe University, the housing typologies on offer range from student apartments through to luxury townhouses and the adaptive reuse of heritage buildings to provide loft type apartments. When designing such a large array of housing that’s developed in stages, we take great care in introducing architectural variation to give the development a sense of becoming established over time. What, in your view, is the most successful element of the project? DL: A rare feature for residential developments of this scale is the fact that walk-up shop-top housing has been integrated into the town centre. This has had a really positive impact. Three storey buildings frame the town square and the movements of residents through the network of small laneways provide vibrancy and activation as well as passive surveillance. The presence of this centrally located housing makes the Polaris 3083 town centre an enjoyable and safe place to be from morning to night. Let’s talk about another of your projects: St Germain Village. This project will see the development of a new neighbourhood. How will the development harmonise with the surrounding built and natural environments? DL: In collaboration with development and environment consultants Beveridge Williams, we are working with the site’s natural topography and the presence of power line easements to turn characteristics that might otherwise be viewed as constraints into opportunities. Attractive wetlands have been created at the low points of the site and are integrated into a landscaped walking circuit that is linked to the town centre. Power line easements will be transformed into a series of linear parks linking each housing estate to the town centre and potentially providing community recreation space, dog parks and space for community gardens. There will be a state of the art medical facility and retirement village. How do you incorporate practical necessities into aesthetically pleasing design? DL: From the outset, it has been the desire of the developer Gordon Gill to include elements such as the medical facility and retirement village to create a point of difference for St Germain Village. These sorts of elements would normally be located at satellite sites within the overall masterplan and disconnected from the town centre. We have flipped this paradigm, with the medical centre and the retirement village fronting and framing the main street. Via this approach, both elements act to activate the town centre via the crossover of complementary uses. The retirement village has been planned to integrate with the main street and offers a diversity of housing types. Working with Mr Gill, we have shunned the traditional fenced and inward facing retirement village model. Those retirement village residences located on the main street are street facing with rear lane access. Key amenities such as the club house are located at the front corner of the site, interfacing with the town centre, promoting community engagement and allowing for potential for multi-generational engagement with the childcare centre planned opposite. The retirement living development also offers a diverse range of housing options including apartments and single level units. Retirement village residents will benefit from the ability to easily walk to the town square in order to access retail, restaurants and medical services. How about another of your projects: Soho Village? You describe using a holistic approach that goes beyond the site, program and norm. What does this mean? DL: Soho Village was the final piece of the puzzle of the award winning Villawood Alamanda Development in Point Cook, Victoria. Working with a private developer, Masbuild, to create the village centre, we have taken the blinkers off and considered the role and potential of this site in the broader suburban context. Many of the elements that have ended up within the Soho Village development have been included as a response to market opportunities that were identified by looking at the surrounding area. 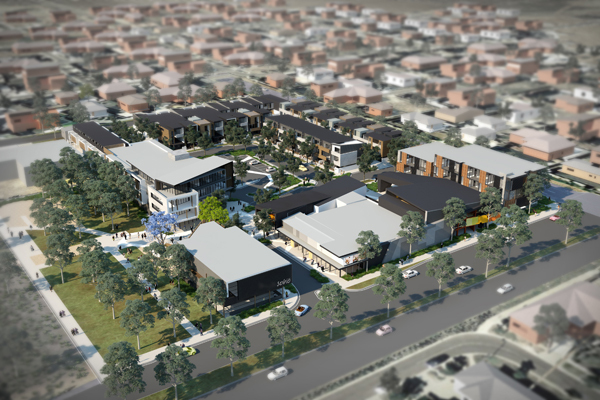 Some of these elements include medium density housing, townhouses that incorporate a ground floor home office, a boutique retail precinct, church facilities that can be hired out as conference, event facilities, and a strong relationship to adjacent parkland that improves the overall amenity and attractiveness of the development. Soho Village will be the village centre for the local community. Was the community involved throughout the design process? DL: The surrounding community is always the number one consideration of our projects. With Soho Village, we saw significant opportunity to strengthen the sense of belonging for residents in Melbourne’s west, with a boutique development that differed from the current market offering. When investigating the site we saw significant demand from the community for housing typologies that were not currently available. Despite a huge amount of development occurring in Point Cook, the vast majority of construction was for large family homes which didn’t necessarily cater to the desires of singles, couples, downsizers. Recognising this gap in the market, we developed Soho Village as the Point Cook’s first ever apartment development, featuring a mix of apartments and townhouses. We also saw demand for greater amenity in the Point Cook area, with restaurants, supermarkets, childcare and parks available on residents’ doorsteps. We have strived to make the Alamanda Development a ‘20 minute neighbourhood’, whereby retail, employment, community services and good quality public spaces are all within walking distance. How does the design complement and incorporate the idea of a shared community precinct? DL: We’re quite passionate about communal facilities becoming the heart of developments, particularly in growth areas and new housing estates where a ‘community’ is still in its early stages. We’ve attempted to create this sense of community through Soho Village, bringing together the mix of dwellings, boutique retail offering and office spaces. These facilities mean residents can remain in their local area and aren’t forced to travel to neighbouring suburbs unnecessarily for shopping, work and childcare. What about your work on Six Thiele Apartments and Pica Apartments? How did the briefs differ and did the design approach differ accordingly? Toby Lauchlan (TL): Both Pica and Six Thiele are apartment developments, but the similarities basically end there. Six Thiele is the only ‘pure’ apartment development of the two, as Pica includes a small retail offering on the ground floor. An inner-city development, Pica comprises of 19 bespoke apartments over six storeys at 8-10 New Street, Richmond. The interiors of Pica fit a black and white scheme but with really crisp finishes; black taps and other fittings, black high-gloss overhead cupboards above the kitchens with a white joinery base. Pica targets the owner-occupier market with a mix of nine one-bedroom and 10 two-bedroom apartments ranging from approximately 50 sqaure metres to one that is over 100 square metres on the top floor with views towards the city. There’s a small cafe on the ground level near the main entry and parking for cars, bicycles and motorbikes. The tight site has also resulted in a mix of different apartment types, so no two dwellings in the building are exactly the same. Six Thiele Street in comparison is a purely multi-residential development of 50 luxury apartments, with no retail component as it’s located on the fringe of Doncaster’s retail precinct close to Westfield Shopping Centre. It features a mix of one and two beds over four storeys, with a three-bedroom apartment on top. The design focuses on maximising storage, and features a pared back palette of materials and finishes that allows each resident to colour the space with their own personality. A vivid geometric graphic theme, which stems from the initial marketing collateral, was applied throughout the complex to generate a cohesive identity and design. This theme was executed in varying forms, from the bold statement of colour in the main lobby space through to the softer and subtler approach in the individual apartment signage. 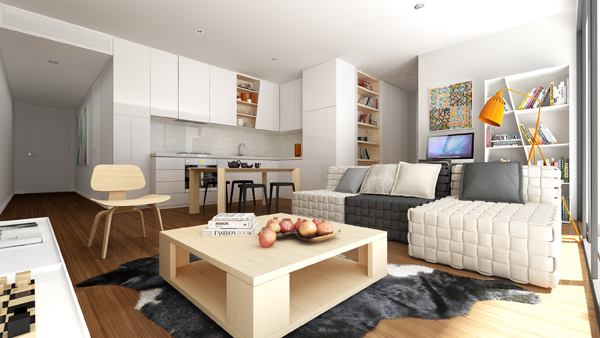 Interior of Six Thiele Apartments, which has been shortlisted in IDEA 2015. What comes first – the visualisation of the completed project from the outside, or the interior floor plan? TL: We consider the site context first in order to develop a concept that addresses the market opportunities and integrates appropriately with its surrounds. From here aspects, views and sensitive interfaces are worked out as well as pedestrian entries, address and basement access. It is at this point that the building envelope is ascertained followed by apartment types and mix. With this strong understanding of the project’s purpose, elements and opportunities we then move onto developing the design concept, working through the look and feel of both the exterior and interiors. How have continuing changes in urban density impacted your approach to multi-residential projects? TL: Our approach to residential design continues to evolve in-line with Melbourne’s ever changing architectural landscape. While once our practice worked almost solely on single residential projects, this focus has gradually shifted towards working with developers to design multi-residential buildings and mixed-use precincts. These larger scale projects have come to be a specialty of our team and are considered to best align with the growth of the company and the city of Melbourne. While our focus may have shifted, our philosophy has held steadfast over the years, with a new team on hand to continue bringing these ideas to life. The ongoing presence of CHC co-founder Les Clarke, who remains a principal within the company, has helped ensure the work of the practice remains consistent and in keeping with its core values. CHC boasts a diverse portfolio of completed and ongoing multi-residential projects. We are quite unique in that our multi-residential projects vary significantly in their size, location and design. Our recent projects range from high-end luxury apartments in Camberwell, investor targeted units in Footscray, greenfield housing projects, and independent living units adjacent to a new town centre. How did you integrate Richmond’s hot air ballooning history into the Pica project design? TL: The developer of Pica owns a ballooning company called ‘Picture This Ballooning’ that has operated onsite for many years and we wanted to reference in the project. In essence it’s about reinventing the site for the new generation of people that are going to live there– so the exterior responds to this with a strong ballooning reference that has been abstracted over the height of the building. We’ve now got a series of rectilinear forms that appear to float up and over the streetscape, and then there are a number of large panels that began as direct images of balloons and through working closely with graphic designer David Pidgeon have evolved into a series of pixelated references of clouds, skies and balloons. The Six Thiele Apartment building has a six star energy rating. What aspects of the design enabled this rating? TL: The project incorporates a range of energy efficient design approaches and materials. Achieving a building orientation that leverages passive opportunities for energy efficiency, utilising the position of the sun and the direction of prevailing winds is a standard approach on all projects. Six Thiele Apartments also featured double glazed windows, insulation, sustainable building materials, water sensitive design and efficient appliances and hot water systems. What excites or frustrates you about the current state of Australian architecture and design? DL: There seems to be a lot more focus on built environment issues in the mainstream media in recent times. Perhaps due to this, across the design and development industry there appears to be greater understanding and acknowledgement of the role architecture, urban design and placemaking play in creating healthy, sustainable and thriving communities. Even the public seem more informed with residents of new developments holding developers to their community oriented marketing messages. How important is sustainability in any design process? How has CHC adapted to suit our environmentally conscious world? DL: A more holistic understanding that takes social, economic and cultural sustainability into account alongside environmental outcomes has superseded the purely environmental definition of sustainability that was prevalent a few years back. We pride ourselves on striking a balance between these aspects on our projects, whether they are on a micro, individual building scale or from a macro, masterplanning perspective. How does CHC’s approach differ when it comes to architecture, interior or urban design? DL: What links all our projects together is our ability to achieve excellent outcomes for developers, communities and purchasers alike. That is, we find ways of simultaneously creating value for the developer and the community, an approach, otherwise known as creating ‘shared value’. Our practice mission and positioning statement is, ‘Creating vibrant communities’. We take this very seriously and invest in ongoing research that looks at methods for achieving better urban development outcomes. In late 2015 we will release a book entitled ‘Creating Vibrant Communities’ that will outline a fresh approach to delivering healthy, sustainable and thriving communities in new growth areas.